In our 3-part series, Greening Your Home, you’ll learn ways to make your home more energy-efficient while also saving you money in the long run. 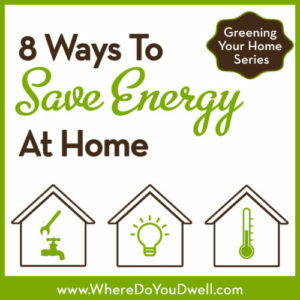 In our second article, we list some simple ways you can save energy in your home. Caring about the environment and being “green” can be easier than you think as a homeowner. You can start today! Believe it or not, even small changes in your home can have an impact on your energy use (and your bills!). Many can be easy to implement and are inexpensive too. Even though we recommend an energy audit by a professional to determine where your home is wasting energy, as discussed in last week’s article, Why Every Homeowner Should Do an Energy Audit, you don’t have to wait to save energy with some simple modifications. Remember that an audit will give you direction on some of the bigger energy issues with your home. Here are some easy DIY fixes that you can do today or over a weekend to make your home more energy efficient. If you don’t have one already than this is a must-do. It allows you to schedule your home’s temperature automatically depending on your daily routine – increase when getting up, decreasing when you’re at work, increasing when you come home, and decreasing when you head to bed. There are so many product selections out there with high-tech features such as motion sensors. You’ll save money heating and cooling your home at the right times for you and your family. And prices have come down so you should find one in your price range. Some power providers will even provide the thermostat and install it for free! For example, you can check out Pepco’s program for DC and MD residents here. 2. Use a Smart Power Strip for Your Electronics. It’s time to leave your old power strips in the dust, and look into a “smart” power strip. Who doesn’t see all the glowing lights from electronics when you turn off a room’s light. That’s energy being used for no good reason! The traditional power strips probably have encouraged you to keep many of your electronics plugged in constantly, using power even when you’re not using them as they wait in standby mode. Smart strips will shut down power to products on standby mode and save you 5 to 10% of your energy consumption. 3. Install the Correct Lightbulbs for Your Needs. With the use of incandescent bulbs a memory now, buying lightbulbs can be confusing! Before you go to the store (and pay for new bulbs), make sure you understand the differences between LEDs, CFLs, and Halogens so you don’t waste money on the wrong bulb. The technology keeps changing and improving than the earlier ones so you might find one you like better now. Since these lightbulbs can last longer and are more expensive, make sure the manufacturer has a good refund or exchange program if something does go wrong. 4. Hang Laundry on Clothes Drying Rack. We know HGTV decorators hate these and want to take them down, but they can help your rooms stay cooler or warmer. Fans can be a low-energy way to keep air circulating so you can keep your temperature set higher in the summer and lower in the winter. Just remember to have the fans reversed in the winter so the air is pulled upwards and away from you. The selection of stylish ceiling fans has improved a lot over the years, so you should find some that match your style. 6. Insulate Exposed Water Pipes. Wrap your hot water pipes in the basement or garage with pipe insulation so they don’t lose heat as the water makes it way to your faucets. It can make a two-to-four-degree difference. Check the pipes coming out of the hot water heater and insulate at least the first three feet. 7. Double Check Your Vents. Walk around your home and make sure you’re not blocking your air vents with furniture or piles of stuff. You want this air flow to circulate efficiently to avoid having the heating and cooling blowing constantly. Also get them dust-free too. It sounds simple and it can be simple. Having a shade tree can help cool your home during our hot DC metro summers. Did you know it can be 10% cooler in the shade? You and your home will be much happier since less AC will need to be cranking. With less direct sunlight on your home, you’ll save energy costs. Don’t forget about energy tax credits that many cities and states offer when you do any energy improvements. Let us know if you have any questions about these easy energy saving tips!